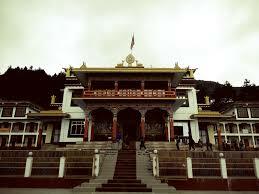 Here is Some Information about GRL Gompa Monastery(Temple)in Bomdila Arunachal Pradesh India. 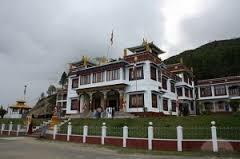 The GRL (Gentse Gaden Rabgyel Ling)Gompa Monastery is located in Bomdila, the headquarters of the west Kameng district in Arunachal Pradesh, It is about 160 km from Guwahati, the capital city of Assam.It is Built in 1965-66 and built by 12th reincarnate of Tsona Gontse Rinpoche .The Gompa is a replica of Tsona Gontse Monastery at Tsona in South Tibet, established during 15th century.The Bomdila Gompa or monastery is one of the most prominent centres of the Lamaistic faith of Mahayana Buddhism. A replica of the Tsona Gontse monastery at Tsona in the southern Tibet, the Bomdila monastery(also known as the Gentse Gaden Rabgyel Lling monastery) was set up by the twelfth reincarnate of the Tsona Gontse Rinpoche. 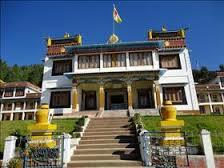 The reincarnate who was born in Morshing, west Kameng, had established this monastery in the year 1965 before his death in 1966. The Gompa comprises a prayer hall, used by the Lamas and the monks for peace prayers, a temple of the Buddha and residential quarters for the monks. Besides the prayers and tantrayana practices, the young monks are also taught about the monastic life and tradition and different subjects by the senior Lamas or the monks of the monastery. The main Gompa is divided into - Lower Gompa, Middle Gompa and Upper Gompa, of which the Upper Gompa is the main monastery. The Lower Gompa is located at the end of the main market. It reflects the beautiful Tibetan architecture. The huge prayer hall is located inside this Gompa. The Middle Gompa is located about 2 km from the main market. 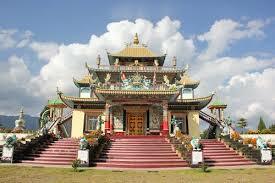 It houses the Blue Medicine Buddha whom the locals believe heals all diseases and is the Lord of Medication. Healing happens in the form of meditation and prayers. The Upper Gompa is the main monastery. 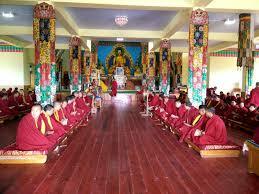 It has a school for the children of the monks, a prayer hall and a temple of Lord Buddha. This main Gompa attracts a number of tourists every year and gives an insight into the peaceful and divine principles of Buddhism. The Bomdila monastery, a follower of the Mahayana school of Buddhism, celebrates numerous festivals important in a Buddhist's life. Losar, being the major one, is celebrated to mark the beginning of the New Year according to the Monapa calendar. This festival goes on for 15 days, in which prayers are offered along with hoisting of the prayer flags. Another festival, Saka Dawa, held on the fourth month of the lunar calendar, marks the day of the Buddha's enlightenment. Torgya is another major occasion celebrated for three days in the eleventh month of the lunar calendar to rejoice the victory of good over the evil. Dukpa Tse-Shi, observed in the 6th month according to the lunar calendar honours the fist sermon delivered by the Buddha while the Lhabab Duechen festival marks the reincarnation of the Buddha in His Shakyamuni form, celebrated on the ninth month of the calendar. 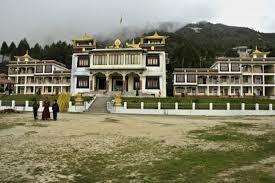 By Road : There are public and private vehecels available to reach GRL Gompa Monastery Bomdila Arunachal Pradesh. By Rail : The Nearest railway station is at Tezpur(Assam ) Station. By Air : The Nearest airport is at Tezpur (Assam ) Airport.